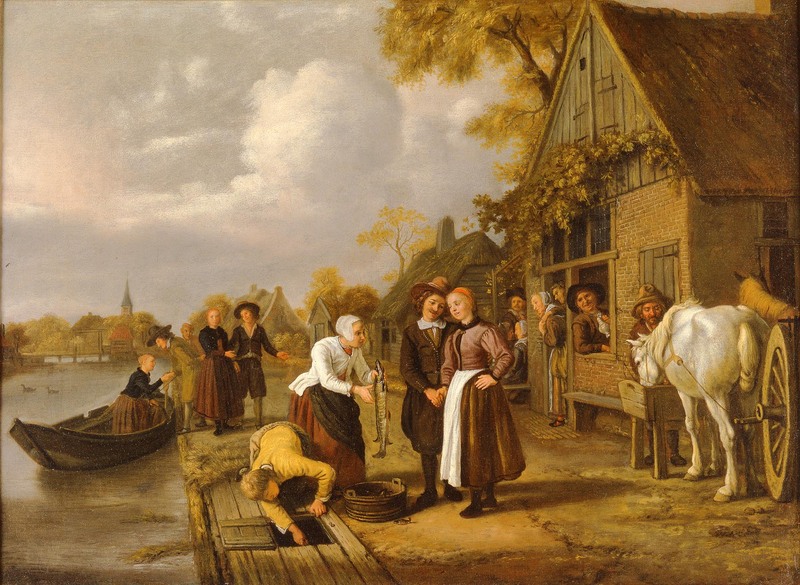 In the last two posts we’ve looked at the earliest known and most recent provenance of our painting The Marriage Trap. We also know that in 1947 the painting was processed at the Munich Central Collecting Point, or MCCP. This means that the painting was looted by the Nazis during World War II. 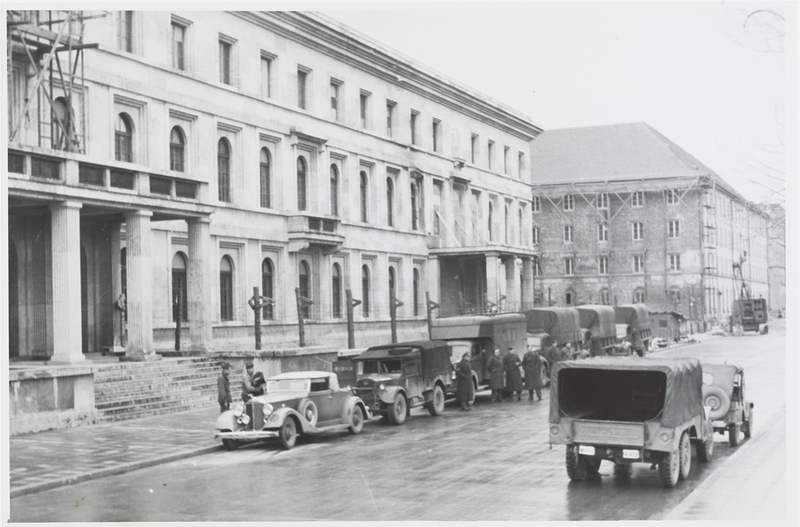 The MCCP was one of the offices set up by the Allied forces at the end of World War II to process the repositories of Nazi-confiscated works of art. These stashes were hidden in Germany and Austria. Managed by the Monuments, Fine Arts and Archives Service (MFA&A) of the military, they were staffed by soldiers and art historians that became known as the Monuments Men. Collecting points were also set up in Marburg, Wiesbaden, and Offenbach. The one in Munich, however, was the largest. The offices there handled a wide variety of material such as painting, sculpture, textiles, and metalwork. Exterior of the MCCP. Image 94 of Photographs of the Central Collecting Point, Munich, by Johannes Felbermeyer. Special Collections of the Getty Research Institute, Los Angeles. Digital image courtesy of the Getty’s Open Content Program. The Munich offices were housed in, ironically enough, National Socialist Party buildings which had been left relatively undamaged by bombing. The MCCP’s first director, Craig Hugh Smyth, was an American officer and trained art historian. He developed an inventory system that was crucial for handling the complicated intake and output process. The crates and objects were given a number upon their arrival at the MCCP. An arrival card was created which included this number as well as the artist, title, prior inventory numbers, arrival date, and condition of the object. Then each object was assigned a subnumber, which was put on a property card that had a detailed description of the work. Other cards were created to facilitate cross-referencing artists, country, period, previous owners, and locations. A separate photographic file of each work was made upon cataloguing. Paintings in storage at the MCCP. Image 101 of Photographs of the Central Collecting Point, Munich, by Johannes Felbermeyer. Special Collections of the Getty Research Institute, Los Angeles. 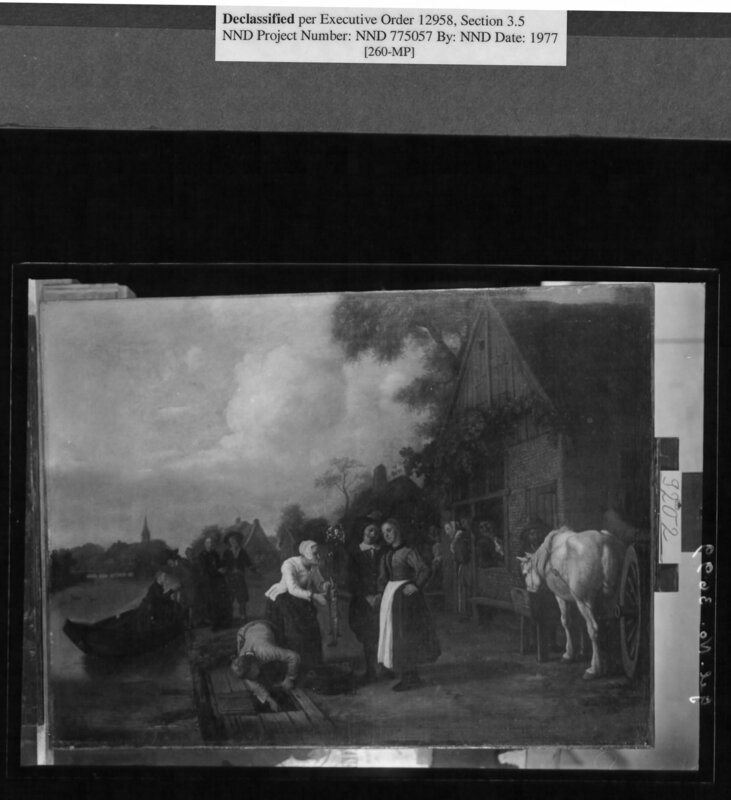 Digital image courtesy of the Getty’s Open Content Program. In this way, the Munich Central Collection Point processed more than 1 million objects between the summer of 1945 and the end of 1951. The collection points sought to return objects to their individual owner, and if that could not be determined, to their country of origin. A few thousand objects were not returned and are still held in Germany. It isn’t clear how the information about The Marriage Trap’s stop at the MCCP came to be known by the Milwaukee Art Museum. The earliest documentation in the object file was the publication of Debra Miller’s dissertation in 1985. But two years before, the MCCP provenance was not included in Sumowski’s book. In order to find out more about how our painting was handled by the MCCP, I did a quick internet search. To my excitement, I discovered that the Deutsches Historisches Museum in Berlin has digitized a number of German archives related to the MCCP and has produced a searchable database of the records. The database went live in the summer of 2008. It was easy to find our painting because we had the object number (called the Munich number): 9202. Searching the database returned hits. I was able to see scans of the front and back of the property card and the documentary photograph, enabling me to confirm that the painting is ours. The Deutsches Historisches Museum was nice enough to transcribe the card’s entry into the database—the copy of the cards in Germany are handwritten and can be difficult to read. The painting was given the title Fishmarket at a River. It arrived at the MCCP on August 15, 1945 and was restituted to Austria on July 30, 1946. 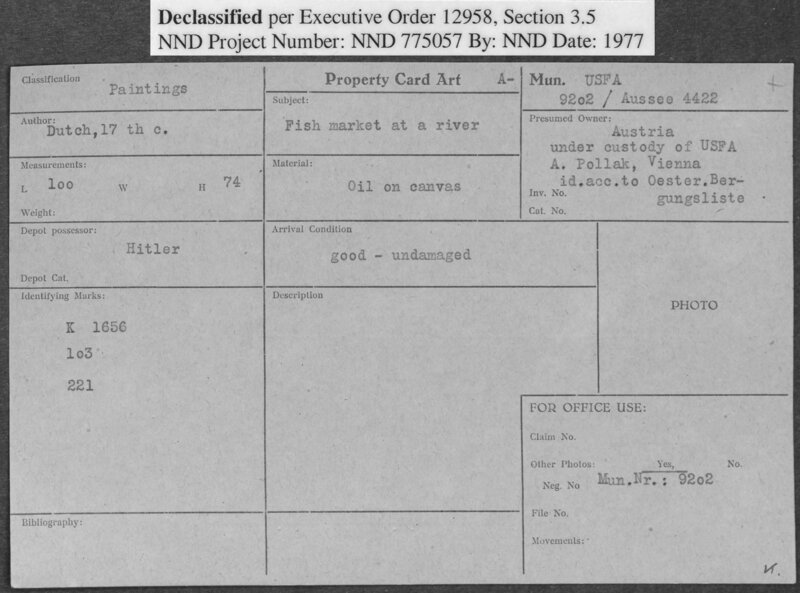 The card notes that the painting was confiscated by Hitler in Salzburg, Austria; no individual owner is known. I have since learned—from a seminar offered by the National Archives—that many more records are held in the US by the National Archives and Records Administration (NARA). NARA records are housed at the National Gallery of Art in Washington, DC and National Archives at College Park, Maryland. Front of card no. 9202 found on Fold3.com. Records Relating to the Munich Central Collecting Point Property Accessions, 8578 Aussee 3825-9211 Aussee 4431, National Archives. Some have been digitized and are available for searching for free on a genealogical website called Fold3.com. Searching on Fold3 shows that NARA has a duplicate property card for our painting (which, incidentally, is nicely typewritten–see above and below). NARA also has the photograph (at the bottom of this post). Fold3 is the first place to search for anything related to Nazi-looted artwork. Back of card no. 9202. Records Relating to the Munich Central Collecting Point Property Accessions, 8578 Aussee 3825-9211 Aussee 4431, National Archives. No more NARA records will be uploaded to Fold3, but additional records are being digitized and added to the NARA’s own online catalogue called OPA. They won’t be done for a long time: NARA holds more than twenty million pages of records created by the Allies in Europe regarding Nazi looted art! They have microfilmed and described these records, but they are not all transcribed or searchable by computer. Photograph of no. 9202 found on Fold3. Photographs Taken by the Munich Central Collectin gPoint, OMGUS, of Artworks Appropriated by Germany during World War II, 260-MP, 8776-9658/5. As you can see from this case study, although repositories are being digitized, provenance research still requires a lot of paper-based archives work. It is complicated and time consuming. And, often after hours of searching, the records might not even be there. There may yet be other paper records related to our painting. For instance, we might be able to find its restitution receipt, which is the list of works sent in a particular shipment to the country of origin signed by the government accepting it. If it exists, it is most likely held at NARA. Next time, we’ll see how to write up all of this information so that others can understand it. After all, it is important to share what we find from research! This entry was posted in Art, Behind the Scenes, Curatorial and tagged Dutch art, nazi germany, provenance. Bookmark the permalink.